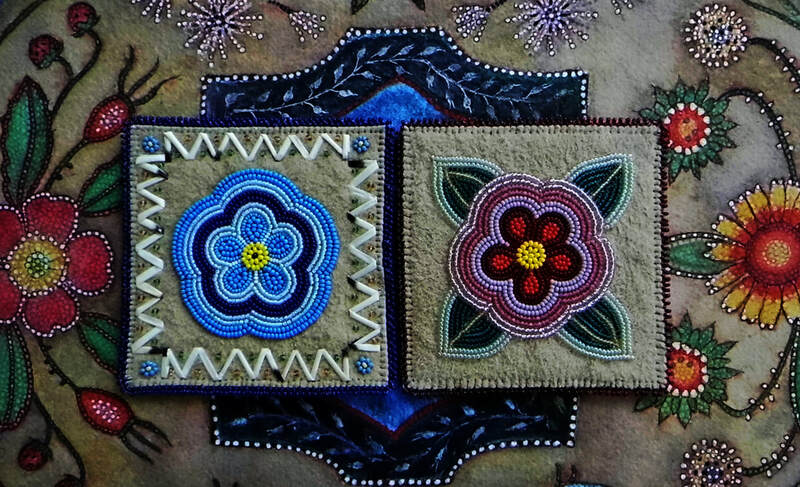 honouring their Grandmothers and Métis ancestral designs. The namesake of this exhibit Forget-me-not, Métis Rose is based on a beadwork design created by Suzette Swift for her granddaughter Eunice. 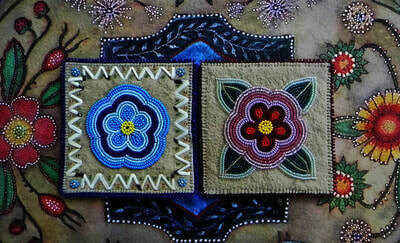 The designed pouch contains Forget-me-not flowers on one side and the Métis rose on the other, as well as a blue and white zig zag designs. These three components were the seeds that grew into the body of work. 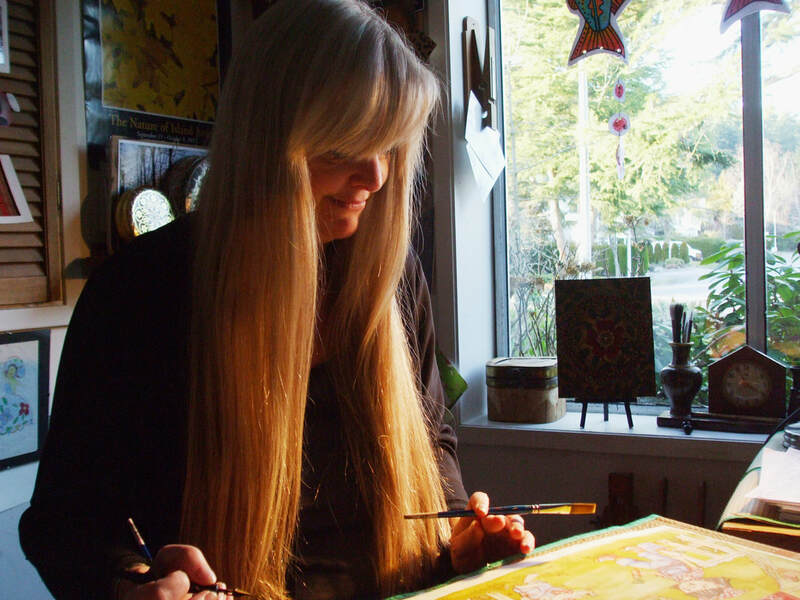 ​Suzette’s granddaughter fondly recalled the wildflowers growing around the homestead – and these have been researched and incorporated into the works. The works incorporate patterns inspired by our ancestors work, and some paintings have been laid out in traditional medicine-wheel colours. Suzette Swift, as a young girl (then Chalifoux) learned her wonderful embroidery and beading skills from the Grey Nuns at Grouard Mission, St Albert. Those early sewing skills were evident in archival family photos where the Swift children pose for us, decked out in matching plaid fabric shirts and dresses - cut from the same bolt. Those same sewing skills were passed down in both sides of the family. 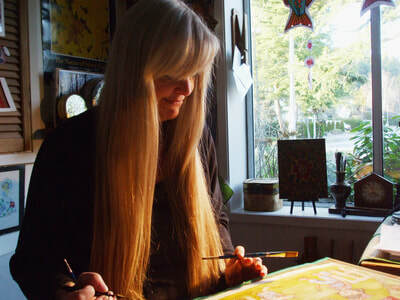 For the past ten years both artists had been following the work of Métis artist Christi Belcourt. Each new piece Christi revealed would resonate until a few years ago she put out a call for artists to join her in the “Walking with our Sisters” art installation project, creating beaded and sewn moccasin tops. Both of the cousins jumped in with what seems like genetic creative enthusiasm. 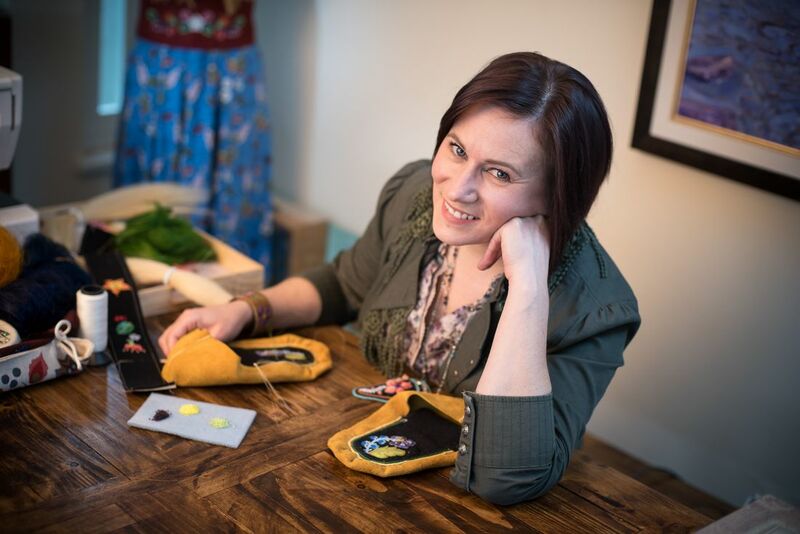 As pieces were posted to the participants group, Lisa recognized some beadwork and the name, ‘Suzette Swift’. A flurry of emails and phone calls, and several years in, a very close friendship developed. From the first cautious conversations, there was a definite creative connection. The first challenge the two artists ran into when creating a collaborative project was how to combine beadwork and watercolour. The next challenge: many miles and an ocean between them. With the help of Canada Post, Lisa sent the central beaded component of the mandala by post and ferry, to Kristi on Vancouver Island. The watercolour artist then set to work creating the next portion of the piece. The artists worked by phone, email, and visits to each others’ studios… mailing items back and forth, inspiring each other with each step. It was not lost on them that the research and hand work was much like pieces of a puzzle coming together. Rediscovering ancestral designs, memories and traditional knowledge, the pieces evolved with a creative flow ignited by their ancestors and shared knowledge. At more than one moment while creating these pieces, the artists would have the sensation that their hands were being led along the exact path of their ancestors, from folding and cutting and flipping paper templates, to imagining what the symbols represented, to wondering how and why a repeating pattern was used. 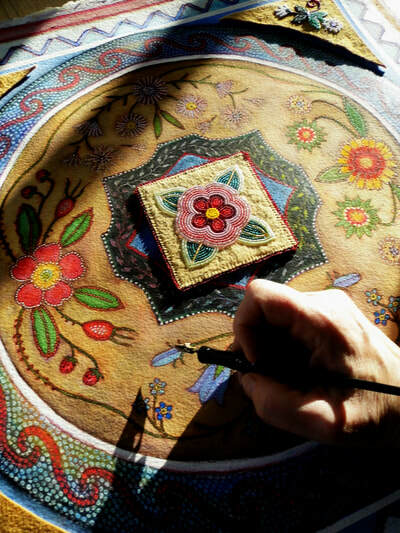 It felt as though the patterns which they had been drawn to their whole lives - the five pointed and fantastical crewelwork style flowers, the bold outlines, swirling embellishments and trailing dots like little beads - were in their genetic makeup. One wonders if this is by way of genetic memory or learned from early appreciation. Either way, it filled their souls. Lisa’s role on the planet seems to be to inspire and teach, and Kristi is experiencing first hand the importance of sharing our knowledge. It creates a hunger for more, and as time passed layers of cultural knowledge came back. And that’s how it felt. It came back. One day Kristi recalled her grandmother’s description of the taste of soopalali. She shared this story with her new-found cousin, and with her usual enthusiasm, Lisa sought it out and whipped up some soopalali, Indian ice cream for Kristi to taste. The grandmothers and Suzette would be smiling now. If Kristi, new to this experience, who had no knowledge of her Métis-hood, brought some soopalali berries to the conversation, and Lisa was able grow this into wider knowledge and some lovely pink clouds of soopalali ice cream, then surely the role of all of us must be to keep this alive.